Rating: 4/5 – Crazy Fun Starring Kor-El, Superman’s Twin Brother! Usually my back issue reading choices are calculated. Catch up on an issue here or read a run of this character there, but sometimes I’ll just dive in and pull out an issue that grabs my attention. The issue that did that this week was World’s Finest issue 247. 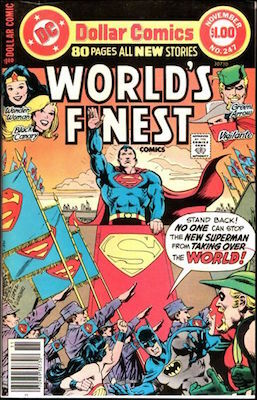 Released in 1977, this issue of World’s Finest gave readers plenty of story for their $1, eighty pages in fact, led by the cover story titled “The Last Hurrah of Superman?!”. Before heading into this review, I’ll let you know that this issue was written by long time DC writer Bob Haney who has written a lot of downright crazy stories, and this one ranks right up there. Haney’s stories usually defy continuity and his crazy team-ups during his Brave and the Bold run (Batman and Sgt. Rock) left those used to reading the main Batman and Detective titles scratching their heads in confusion as to how it all made sense. All that being said, many of Haney’s stories are entertaining and fun, if you can get past his lack of ‘realism’ (realism in the context of super-heroes, anyway). In order to give you an idea of just how crazy this issue is be warned that there will be more spoilers than usual, but considering that this issue is now over thirty years old, hopefully you’ll forgive me. As the story opens, Batman is being held at gunpoint, disguised in a trench-coat and fedora. Why he chose to still wear his costume underneath a trench-coat, and not just disguise himself as a regular human is just the first hint that we’re about to read something special! As we flashback, we come to understand that Superman has learned that he had a twin brother named Kor-El. Just moments after his birth, Superman’s mom had a second child, but he was unfortunately born mis-shapen. Knowing that Jor-El would never accept a child like this, she hides him in a cave that protected him when Krypton exploded. Where did that rock chunk with the cave land? You guessed it, Earth! When Kal-El finally runs into his unknown brother at a young age he exclaims that “there’s only room for one Superboy” and puts him back into the cave, and punches him back into space. After years of mentally blocking this out of his mind due to the guilt being too painful, Superman breaks him free and the revenge Kor-El unleashes has him creating a world army that’s depicted on the gorgeous and creative cover as we lead right into that opening page with Batman at gunpoint. And that’s all in just the first three pages! Crazy….but so much fun. The writing will make your eyes roll in it’s premise, but it’s still such an enjoyable read. Kurt Schaffenberger’s art although a bit simple is a great match for the tone. At times the “mis-shapen” Kor-El isn’t different enough to tell the two Supermen apart, but over the course of this story’s twenty pages he draws a lot of action and characters. The true stand out in terms of art in this issue is in the follow up stories starring Black Canary and Green Arrow. Sal Amendola’s art here is such a departure from Schaffenberger with his thin and fast moving line and creative layouts. He depicts werewolves that are truly scary, and Black Canary looks beautiful. This issue also gives you a story starring the Vigilante as well as a final tale that pits Wonder Woman against Baron Blitzkrieg. World’s Finest gave readers a great value for their money then, and I found so much value in it now. This issue, and those close to this number can be had on the cheap at local cons or on-line. Something to consider for people who think current comics at $3.99 each are a bit expensive, there are a lot of great comics at reasonable prices in back issue bins! If you can accept these stories for what they are, then there’s really so much to enjoy and this issue is a great example. Give this issue a shot and get a taste of the stories that writer Bob Haney became famous for. This entry was posted in comic book, comics, DC, DC Comics and tagged back issues, Batman, Black Canary, comic books, comics, DC Comics, Sal Amendola, Superman, vintage comics, Wonder Woman, World’s Finest. Bookmark the permalink.